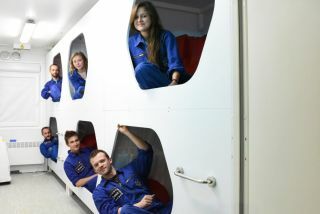 A crew of six has just completed their two-week simulated moon expedition at the Habitat Lunares base in Poland. The mission, called Lunar Expedition 1, began Aug. 15 and wrapped up Aug. 29. It is the second of four expeditions at the mock space base this year. Lighting inside the habitat is remotely controlled from the Mission Control Center located in ESA's technical facility in the Netherlands. During the two-week-long mission at the isolated lunar habitat, the six analogue astronauts of Lunar Expedition 1 conducted scientific experiments focused on time perception and changes to the crew's biological clocks during their stay, according to the statement. "I regard Lunares as an extremely valuable new chronobiological laboratory for Europe, with full bioethical committee agreements in place, provided by the Medical University in Poznań. We'll be checking how the participants' subjective time perception alters with the changes we induce," Kolodziejczyk said in the statement. An LED light system inside the habitat uses a combination of colors to mirror changes in sunlight throughout the day. Mission Control managed the shifts in light to extend the length of the artificial "day" and offset the crew's circadian rhythms, much like what astronauts endure in space. This disruption to one's natural body clock has been known to decrease immunity, sleep quality and concentration for astronauts in space, ESA officials said in the statement. However, a new set of "physiological lights" being tested in the lunar habitat emit in the ultraviolet, which may help reset astronauts' natural circadian rhythm. Studying the impacts of the redesigned lighting system inside Lunares will help to improve spacecraft lighting systems and, as a result, the health of astronauts. In fact, lighting aboard the International Space Station was recently updated to help astronauts sleep better. The Lunares crew also performed simulated moonwalks wearing space suits in an adjoining airplane hangar filled with moon-like basalt rocks to replicate the lunar surface. Other experiments during the mission focused on group dynamics and stress under isolation, as well as biological life support systems and management of limited resources such as water. Two more missions are planned for this year. They are an educational mission for kids called Moon for Youth in September, and another crewed analogue mission in October called ICAres-1.